Back in the day, my system of rating recipes was pretty basic. I pulled a recipe out of the folder, made it, and if I liked it, I put a check mark on the page. The idea was that all these checked pages would promptly be filed away in my 3 ring binder and become my low tech recipe database. Or if I wasn’t completely sold on a recipe, I’d scribble some notes on the page, put it back in the folder, and make it again later. Sometimes my follow through was better than others. As I’ve been weeding though my old recipes to make them to post here at BAH, my new high tech recipe database, I’ve been trying to reconcile the checks with the final dishes. And I can’t always figure out what I was thinking. Take Nigella’s Beef Stew. The page that I printed out from Food Network had not one, but two checks. No notes, just multiple checks, meaning that this was a keeper that I really liked. Having just made it again so that I can tell you about it here, I can’t remember what I liked so much about it to warrant two enthusiastic checks. The orange juice and zest are unexpected and give a refreshing brightness to the dish. But that’s about all I can come up with. Not to say that this isn’t a keeper. It is. 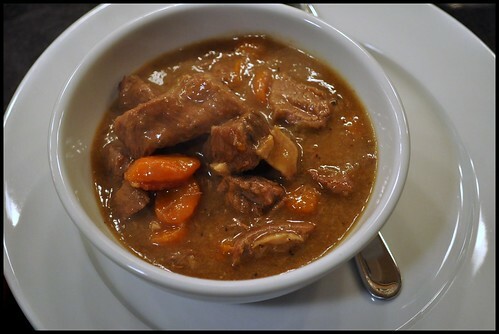 Everyone should have a can’t fail beef stew recipe. Who knows, served up with some biscuits, this might just be the one for you. BAH Note: Nigella says, “This is best reheated 1 or 2 days after, but if you are serving the stew on the same day, then add another half hour to the cooking time just to make sure the meat is soft, mellow and tender.” If you’re only feeding one or two people, and aren’t big on leftovers, I really recommend that you scale this recipe down by half. Or make a full batch and immediately package some for long term storage in the freezer. Because 4 1/2 pounds of beef makes a lot of stew. But Nigella is spot on when she says that the stew is better a day or two after it’s made. Place the flour, dried sage, and beef rub in a large plastic bag. Close the bag and shake to combine. Add the beef cubes to the bag and shake to coat all the pieces evenly with the seasoned flour. Heat 4 tablespoons of oil in a large dutch oven and sweat the onion and carrots for 5 to 10 minutes until they soften. Remove the onion and carrot and place in a bowl. Add two more tablespoons oil to the pan. Working in batches, brown the beef, adding more oil as needed. Move the browned beef to a large bowl or plate. When all of the beef has been browned, add the beer and orange juice to the now empty dutch oven and bring to a boil. Add the beef broth, orange zest, browned beef cubes (and any accumulated juices), bay leaves, brown sugar (if using), and vegetables to the pan. Add water if needed. Bring to a boil then reduce to a simmer. Cover and cook for 2 1/2 hours or until the beef is tender and fully cooked. Beef stew and biscuits…now you’re talking! You betcha Tracy. We needed all those tasty calories to dig out of Mother Nature’s wrath. Your recipe system makes me laugh, mostly because, I’m a total failure at most things organizational. It’s the secret shame of my otherwise Type A life. Noel’s decided that 990 Square is the device, since “anything he would want to cook again makes it on to the site”. It’s really cute to see him looking up recipes on the site on his iPhone (or right now his *borrowed* iPad. Beth, you’re too funny. I agree that the blog is my “device” but I can’t function without having the recipe on a piece of paper in front of me. Besides being physically able to touch it, I can be rather messy and I can’t imagine the agony of getting a sassy electronic device coated in flour, egg, or milk. My iPhone has been coated in flour and butter so many times! I just have it in an all plastic skin, so I wipe it off and keep on trucking. If I actually print out a recipe then I feel the need to keep it, and then I’m back at no organizational system! Isn’t it a vicious cycle? I’m not a stew girl, but my Daddy-O is, so I’m bookmarking this for his birthday in October! Kitch, what a great plan. I really do recommend making the stew a day before and letting all the flavors come together. And did I mention that this recipe was much more friendly than Ina’s Parker House Stew? I recall that was a huge pain to make and I thought it was only so-so.